For the insect, see Cricket (insect). Cricket is a sport which is played between two teams of eleven players each who score runs (points) by running between two sets of three small, wooden posts called wickets. Each of the wickets is at one end of a rectangle of flattened grass called the pitch. Around the pitch is a much larger oval of grass called the cricket ground. There is 30 yard circle between the ground (stadium). The game started in England in the 16th century. The earliest definite reference to the sport is in a court case of 1598. The court in Guildford heard a coroner, John Derrick, that when he was a scholar at the "Free School at Guildford", fifty years earlier, "he and diverse of his fellows did run and play [on the common land] at cricket and other players". Later, the game spread to countries of the British Empire in the 19th and 20th centuries. Today, it is a popular sport in England, Australia, India, Pakistan, Sri Lanka, Bangladesh, South Africa, New Zealand, the West Indies and several other countries such as Afghanistan, Ireland, Kenya, Scotland, the Netherlands and Zimbabwe. There are two teams: The team bowling has 11 players on the field. The team has been bowled, hitting the ball over the boundary, or by the umpires penalizing the bowling side for bowling an illegal ball. The captain of the bowling team chooses a bowler from his team; the other 10 players are called fielders. The bowler is trying to aim the ball at a wicket, which is made up of three sticks (called stumps) stuck into the earth, with two small sticks (called bails) balanced on them. One of the fielders, called the wicket keeper, stands behind the wicket to catch the ball if the bowler misses the wicket. The other fielders chase the ball after the batsman has hit it. The bowler runs towards his wicket, and bowls towards the batsman at the other wicket. He does not throw the ball. He bowls the ball overarm with a straight arm. If he bends his arm, the other teams are given one run and he has to bowl the ball again. An 'over' is six balls meaning he bowls six times. Then another player becomes the bowler for the next over, and bowls from the other end, and so on. The same bowler cannot bowl two overs one after the other. · The batsman misses the ball and the ball hits the wicket: called bowled, or being "bowled out". 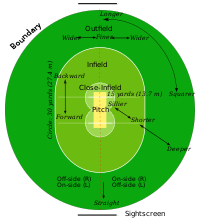 · The ball hits the batsman's body when it would have hit the wicket otherwise. Called LBW (leg before wicket). The way this rule is applied is complicated; this is just the general idea. · A fielder catches the ball after the batsman hits it, and before it bounces or leaves the field: called caught. · While the batsmen are running, a fielder can throw the ball at the wicket. If the batsmen cannot finish the run in time, and the ball hits the wicket, the batsman nearer to the wicket that is hit is out: this is called run out. When a batsman is out, another comes onto the field to take his place. The innings is over when ten wickets are taken (i.e. ten of the eleven batsmen are out). After this, the team which was the 'fielding' team becomes the 'batting' team. They now have to score more runs than the other team managed to score. If they score more runs before ten wickets are taken, they win. If they do not, the other team wins. In a one-day game, each side has one innings, and innings are limited to a certain number of overs. In longer formats each side has two innings, and there is no specific limit to the number of overs in an innings. Cricket is popular in many countries, mostly in Commonwealth countries. The countries where cricket is most popular compete in international matches (games between countries) that last up to 5 days, which are called Test matches. Those countries are England, Australia, West Indies, South Africa, New Zealand, India, Pakistan, Bangladesh, Zimbabwe, Ireland, Afghanistan and Sri Lanka. The West Indies are a group of Caribbean countries that play together as a team. Several other countries have more junior status. The test match idea was invented by teams from England and Australia in the 19th century.Ireland and Afghanistan are the new teams which can play Test cricket. Cricket is also played in Kenya, Canada, Bermuda, Scotland, Holland and Namibia; the national teams of those countries can play one-day international matches, but do not play test matches. A standard cricket ground, showing the cricket pitch (brown), close-infield (light green) within 15 yards (13.7 m) of the striking batsman, infield (medium green) inside the white 30 yard (27.4 m) circle, and outfield (dark green), with sight screens beyond the boundary at either end. A cricket field is where cricket is played. It is circular or oval-shaped grassy ground. There are no fixed dimensions for the field. Its diameter usually varies between 450 feet (137 m) to 500 feet (150 m). Test matches are the top international matches played between countries. The countries permitted to play test matches are accredited by the ICC: the International Cricket Council. The twelve countries are listed below, with 'West Indies','England', 'Ireland' counting for this purpose as a country. Tests last for up to five days: it is the longest format of cricket. Called counties in England, and states in Australia and islands in the West Indies. These are three or four day matches. A perspective view of the cricket pitch from the bowler's end. 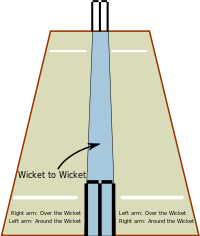 The bowler runs in past one side of the wicket at the bowler's end, either 'over' the wicket or 'round' the wicket. In these games, the length is determined by the number of overs, and each side has one innings only. A special formula, known as the 'Duckworth–Lewis method' is applied if rain reduces the time for play. It calculates the target score for the team batting second in a limited overs match interrupted by weather or other circumstance. ODIs are usually restricted to 50 overs batting for each side. The highest team score is England 481-6 against Australia in June 19, 2018. The highest individual score is 264 off 173 balls by Rohit Sharma for India against Sri Lanka. Twenty20 cricket has 20 overs for each side. The highest team score is 263/5 by Royal Challengers Bangalore (RCB) against Pune Warriors India (PWI) in the 2013 IPL season. The highest individual score is 175* off 69 balls in the same match by Chris Gayle for RCB in the same match. A batsman's batting average is the number of runs he has scored in a period (such as a year or his whole career), divided by the number of times he was got out in the same period. A good batsman has a high batting average. The highest T20 average for a batsman who has played at least 20 innings is 70.66 by Chris Harris. A bowler's bowling average is the number of runs that have been scored while he was bowling, in a period, divided by the number of batsmen he has got out in the same period. A good bowler has a low bowling average. The lowest T20 bowling average for a bowler who has bowled at least 500 balls is Mushtaq Ahmed with 13.80. There is a separate set of averages for each type of cricket listed above. ↑ "Records - One-Day Internationals - Team records - Highest innings totals - ESPNcricinfo.com". Cricinfo.